Bristol, 8 May 2016: The British Labour Party made a clean sweep of last Thursday’s four mayoral elections, winning not only in Liverpool and London but also in Salford (Greater Manchester) and Bristol. The latter result, which was only announced yesterday, surprised probably the most. Bristol’s independent Mayor George Ferguson has in his four years in office gained national and international prominence, particularly last year, when Bristol was Europe’s Green Capital. During his time in City Hall, he was invited to the Vatican and met UN General Secretary Ban Ki-Moon as head of a delegation of European cities. But while his international fame rose  he was nominated for the 2014 World Mayor Prize  Ferguson became increasingly unpopular at home. Nevertheless, the size of his defeat was unexpected: he lost by almost 30,000 votes. 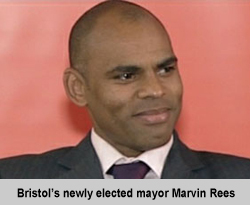 An exit poll taken on Thursday had predicted a neck-and-neck finish between the mayor and his main rival, Marvin Rees. 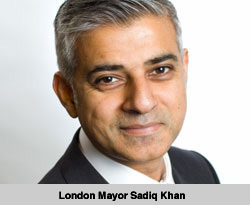 London, 6 May 2016: After the most divisive campaign since the introduction of directly elected mayors in 2000, London has elected the Labour candidate Sadiq Khan as its new mayor. At times, the election strategy of his Conservative opponent Zac Goldsmith seemed entirely focused on the mayor-elect’s Muslim religion. The Conservative team made every effort to link Sadiq Khan, a civil-rights lawyer before entering politics, to radical Islamists and to insinuate that the British capital would be less safe under the Labour candidate’s leadership. Even before the election results were announced, members of the Conservative (Tory) Party have questioned the Goldsmith campaign, calling it divisive and racially charged. Former Tory chair, Lady Warsi, said the ‘dog whistle campaign cost the party the election and its credibility on racial issues. Zac Goldsmith’s sister Jemima, who was once married to Pakistan’s former cricket captain Imran Khan, criticised her brother’s campaign, saying it didn’t reflect her brother’s true character. She described Khan as a great example to young Muslims. Sadiq Khan also had to endure the openly hostile election coverage of London’s only evening newspaper, the Evening Standard. Independent research found that the newspaper repeatedly printed negative stories about the Labour candidate on its front pages, while similar articles on his Tory opponents were published with little prominence on inside pages. One of the first to congratulate Sadiq Khan on his victory was New York City Mayor Bill de Blasio. He described him as a fellow affordable housing advocate and hoped to meet him soon. With the election of Mr Khan, most of Europe’s and North America’s leading cities are now led by centre-left mayors. They include Paris, Berlin, Madrid and Washington DC. Rome will elect a new mayor on 5 June. Elections were also held to the London assembly. Preliminary results indicate that Labour will have a majority of seats in the Assembly. 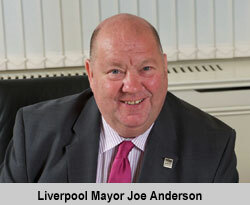 Liverpool, 6 May 2016: Liverpool’s socialist Mayor Joe Anderson was comfortably re-elected on a day that saw Britain’s Labour Party lose seats in regional elections in Scotland and Wales. Yesterday, mayoral elections were also held in London, Bristol and Salford but results are not expected until later today or even tomorrow, Saturday. The London campaign had been marred by accusations of anti-Semitism in the Labour Party and by Conservative attempts to link the Labour candidate to radical Islamists. In Bristol, an exit poll predicts a close finish between the incumbent independent mayor and his Labour challenger, while in Salford (Greater Manchester), usually a Labour stronghold, the candidate from the right-wing UK Independence Party (UKIP) is hoping to make inroads into the working class vote. While the Labour Party is hopeful to re-capture London City Hall from the Conservatives, it had an awful night in Scotland, where, in elections to the regional parliament, it lost 13 seats, while the Conservatives gained 16. The Scottish Nationalist Party (SNP) narrowly missed out on an overall majority and is now likely to negotiate an agreement with either the Liberal Democrats and/or the Green Party. The Scottish Labour Party, which for decades dominated politics in Scotland, suffered its worst result since the establishment of the Scottish Parliament in 1999. The Conservatives achieved their best ever result. Labour did better in regional elections in Wales, where it remains the largest party but likely without an overall majority. For the first time, the anti-European UK Independence Party will be represented in the Welsh Assembly. In England, Labour did better than expected, not only retaining Liverpool but also hoping to capture London and perhaps even Bristol. Early results indicate that the party held on to a number of marginal councils and may even increase its overall share of the vote. Final results will not be available until midday / late Saturday.